Welcome to the start of the World Cardmaking Day hop! We’re so glad you’ve joined us as a blogger OR a hopper – or both! There’s plenty to see – so sit down with a cup of coffee and a snack, and be ready to make notes about what you see and are inspired by! If you haven’t checked out our OWHtv or vlogs – be sure to click on the videos off to the left – you’ll catch up on some of the latest news about OWH! Attn bloggers: 27 of those who signed up didn’t have cards posted. 😦 We had to close the InLinkz, but checked again hours later before we did- you can hook up your card on the Homefront Blog if you wish! Someone on Facebook suggested that Sandy make a Crisp and Clean card with limited supplies….so for this card, it’s scraps! Yes, scraps! Cut crisp and clean, though 🙂 The tree is layered, which also makes it pop against the background paper, and it’s on heavy duty green cardstock for a base. The ribbon was made with a Bow Easy and adhered with Gluedots. We’re trying the hop differently this time; we’ve added all the blogs to InLinkz! (It’s closed, so no blogs can be added now.) So scroll through the images and pick a blog to start with – or hop through them all! Leave comments as much as you can, we all love to hear that we’ve inspired someone with our creation. Please be certain to visit the blogs with **asterisks** around them. Those are our corporate partners, and we want to show them OWH-style love! (They also are pretty likely to have some darned good blog candy!) You can subscribe to them on their blogs too…they’ve got lots of fun going on all the time, not just with OWH! Sandy–What a personal and constructive vlog! The way you presented made me feel as if I've always known you. Looking forward to getting involved in the site, as I've been writing to the troops since I taught middle school in Colorado oh..so..long..ago–before I met/married a Navy man. We had all our 7th graders write a general, newsy/from the homefront letter, and sent them off in a packet to an aircraft carrier chaplain. What a response we received! Thank you for your service in this great cause–and now…I hop! See you soon! Ooops!! I made mine go live at 3AM PT not not ET. 😦 sorry Sandy!! My blog link #64 isn't working.What a lot of hard work you have all put in. Thank you! You've made World Cardmaking Day so special! Thanks Sandy for all you do. 🙂 I really love your card (and using scraps). I try to use scraps at all times. This is going to be fun. Off to hop!Hugs! here is my link: http://simplysusansscrap.blogspot.com/2011/10/operation-write-home-world-cardmaking.htmlstill not sure why it didn't post…..but off to check out everyone's cards! Well, I will try to be more specific on my comments. I usually try to pick the best element of the card to comment on. But, sometimes, I really do love everything about the card and I say so. Love OWH! Happy World Card Making Day! What a wonderful card. Thanks for for sharing the idea. I have so many scraps I just can't part with. All the cards look so wonderful. I just need to hurry through my day so I can get back here to look at all of the sites. Love your scrappy Christmas tree! Great way to use up those pittle pieces of paper. Great blog hop from what I've seen so far! I'll enjoying visting everyone over the course of the weekend. This format makes it easier to keep track of who has and hasn't been visited and not having to deal with broken links is wonderful. Thanks to the hop team for all their hard work! Thanks for all of the hard work and for a great blog hop. Everyone's work is incredible. Unfortunately, I am having a problem with many blogs not allowing me to post comments. I am getting a message saying "Cookie Value is null for Form Restoration." I asked some computer savies and was told it sounded like a security issue on the part of the blog owners. Any advice anyone? I want to share the love. I liked the old way of hopping, by clicking a link to the next or past blog. Maybe I'm not doing this one right but when I click on the blog hop emblem it takes me to a different page than where I started. I am having difficulty posting comments on some of the blogs. Not sure if it's from my end or not. Will take a break and try again later. Awesome image; downloaded and can't wait to use. Love this card! Thanks for all your hard work coordinating the hop, it looks FAHBULOUS! I am trying to comment on some of my favorites, but some of the blogs comments error out. I will try again – really some great work done on these! Wow! I've only looked through about 1/3 of the blogs so far and left comments on all that didn't require me to register first. There are SOOO many fabulous cards — what a great group of crafters share their work with OWH! I'll have to step up my own game to keep up.I'm new at "hopping" and the only way I can go to another blog is to go back to this page each time and click on the next thumbnail. If there's a better way, someone please educate me? Sandy!!! The nurse in me thinks that your jammies look like a hospital gown!!! I was terribly concerned!!! 😀 thanks for the vlog… I was just thinking what nice comments I have already!!! Big hugs to you and have a great vacation!!! I'm also watching some of my comments disappearing into the twilight zone of the blogasphere…but do love the format to see them all on one place and click to go there. Thanks for tips on commenting, making it much more interesting to do and to read…when they show up! good job! At least I know now that I am not the only one having trouble posting. I love all of the talent that I am seeing and wish I could share it with all of you personally. Great job everyone! This is my first OWH hop and my sincere kudos to you Sandy and your 'elves'. Such fun and the OWH bloggers and just awesome. Oh, and great comments so far, I love it! Enjoyed seeing all the cards and blogs. I love this card. the scraps worked perfectly for the tree. Wow – I could spend all day on this hop! So many eye-catching cards with great inspirational ideas. It helps me to see how other people join different patterned paper to make a pleasing background. Eek! It's been hard today to find a balance between making cards and checking everyone's blog! I did get two cards made today — hopefully more tomorrow. And now that it's time to clear the craft table (a/k/a dinner table), I'll get back to perusing all these great blogs! I fully intend to get through them all — too many great ideas to miss even one!Thank you Sandy and all your elves for pulling this off! Beautiful job Sandy and elves! The hop is great!!!!!! Great blog hop Sandy, thanks for letting me participate! such a great cause! I'm looking forward to getting involved in this! Whew! Just finished looking at the last of these great hop sites and left comments for everyone except one or two that required me to register, and one where all the links were locked (sorry SleepyInSeattle — I would like to be a follower of your pretty cards).So many talented cardmakers, and a great representation of a vast variety of wonderful cards. Thanks Sandy for all the effort that went into the hop. Thank you and my shipper, Dixie, and Kris for all the really hard work you put into getting the cards out. Wish I were close enough to lend a hand!!! Thanks for ALL the hard work that has gone into pulling this off. I can't imagine with all the other things you do, too!! WHEW!! What inspiration. Thanks again! Thanks to everyone who helped to organize the hop, posted a card, and/or hopped around and left nice comments. It was my first time posting and it's been so nice to read everyone's kind comments on my card. I made it through all of the blogs and left comments on almost every one. I have tons of ideas to use now. 🙂 For those of you who said you thought this kind of hop was hard, I would suggest using multiple tabs. I kept OWH's page open in one tab and used ctrl+click (mac) or right click (pc) to open new tabs for a few blogs at a time. Once I'd read them, I'd close the tabs and open the handful of blogs. It certainly seems better this way than the old way which left us with broken links. Also, I love having the thumbnails to refer to later on. Thanks again for a fun hop! WOW! Lots of inspiration out there. I have to admit that I didn't have a lot of time to hop this weekend, but I did visit every company's blog (marked with the asterisk) to thank them for supporting OWH. I got a chuckle out of the "great card" comments I saw as I was leaving my specific comments after watching your vlog. Oh well, best you can do is try to get the word out! I think if the hops were shorter people might take more time to leave more specific comments – just one person's opinion. 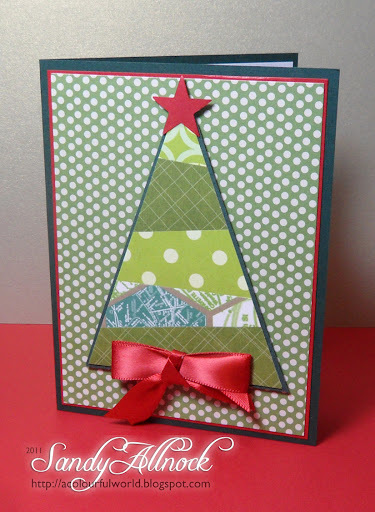 Sandy, I just wanted to tell you I love your Christmas tree card and I really want to try that technique! I had computer trouble all weekend, so I hope to look at all the bloghop cards today 😮 !Even if I can't leave comments on everybody's I will enjoy looking at them all! Oops–I first wrote (on eaten post) how much I enjoyed all the inspiration of the wonderful cards posted! Sandy, thanks for reminding us to leave constructive comments, it is much more helpful than just "great card". I think you are very good at saying what we need to hear,even if sometimes we don't want to hear it! LOL! I guess what I mean is that you give us good direction.